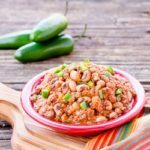 Mexican Chorizo Black-Eyed Peas are a spicy and hearty side dish. It's a recipe to kick up regular plain peas with extraordinary flavors. Heat oil in a large soup pot or Dutch oven over medium-high heat. Add chorizo and cook, stirring to break up and crumble, for 5 minutes. Add onion and celery. Cook, stirring occasionally, until vegetables are softened and chorizo is cooked completely, about 5 minutes. Add jalapeños and garlic. Stir and cook for 1 minute. Add tomatoes and wine. Stir to combine. Bring to a boil then reduce heat to low. Loosely cover and cook for 45 minutes, stirring occasionally. Add black-eyed peas. Stir to combine and cook for 15 minutes. Serve with diced jalapeño peppers for garnish if desired. I used 5 cans of black-eyed peas. You can also cook 1 pound of dried black-eyed peas to use (no seasoning, just peas and water per package instructions). Do not try to cook black-eyed peas in sauce because the seasoning will prevent them from softening.